The facilities are amazing, I mainly work on film and NTU has everything I could possibly need, especially within the photo store - there is a good range of formats to experiment with. "I chose to study at NTU as I have always loved Nottingham as a city so the location was a big factor for me. 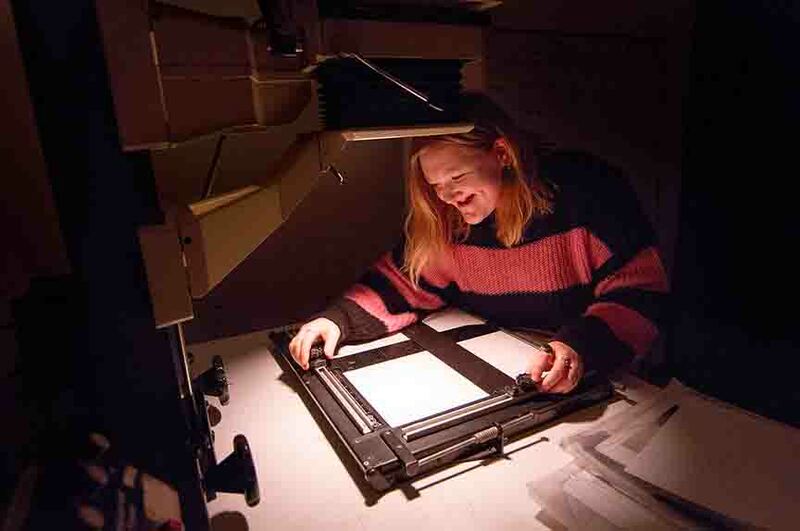 However, one of the main reasons I chose NTU is because of the Photography facilities, the colour darkroom in particular drew me to this course." "I love how open the course is. I don’t feel pressured to work within a certain medium or a particular way, as the tutors all differ in their own styles and way of working too. It’s good to be surrounded by lots of different creative people." "My self-initiated project for my degree show has been my favourite project so far. I am documenting the pottery industry in Stoke-on-Trent and have been visiting different pottery factories and studios in the area. I am really enjoying talking to the workers and documenting their workplace." "Exhibiting at New Art Exchange has been a fantastic opportunity to showcase my work outside of the degree show, I was delighted when I found out I had been chosen!" "Yes, and I really enjoy this element of the course. Recently, Patrick Sampson, who is an alumnus from the course, visited us to talk about his career as a photographer’s assistant - I found this to be insightful. To me, hearing guest speakers discuss the way in which they began working within the industry is a very important part of the course, and it’s something that I feel I have learnt a great deal from." "The tutors and technical staff on the course are amazing. If you have a technical problem within your work that you need to solve, there is always a staff member willing to help. My tutors have always encouraged me to go further with my work and to push myself, and a lot of the encouragement I have been given has really helped to inform my practice." "The facilities are amazing, I mainly work on film and NTU has everything I could possibly need, especially within the photo store - there is a good range of formats to experiment with. The workshops are very informative, we learn various techniques and skills at a more advance level. "As for the wider University, Bonington Gallery always has something interesting on and many a time it has informed my photographic work. "The SU is a really great place to chill, I love the craft and vintage fairs that are held there. The photography section of the library is also amazing, I have found it very useful for inspiration as there is an extensive collection of photo books, which I love!" "I love the creative atmosphere of the city, the different art galleries, independent shops, bars and businesses are all great. In terms of my creative practice, The Photo Parlour, an independent film lab and darkroom, has really helped me to engage with photographers from across the city that are not on my course, and helped to enhance my studies whilst at NTU." How do you find the student community within the School of Art & Design and the wider University? "There are always lots of opportunities to collaborate with different students across the different Art & Design subjects which is good. I’ve done collaborations with Fine Art students before and found it opened up many other opportunities within the School. "There are so many ways to meet new people through joining societies, collaborating and even being a Student Ambassador. I’ve met so many people that I wouldn’t have normally had the opportunity to speak with through my role as a Student Ambassador!" "During Year Two we are encouraged to find experience within the industry. I contacted The Photo Parlour and began working there during in the second term of Year Two. The Photo Parlour is an independent film lab and community darkroom - I learnt a lot about what goes into running a creative business here, but also learnt a great deal about film processing and printing. "It was also an amazing opportunity to make new friends and be surrounded by creative like-minded people that can offer invaluable advice." "I would recommend this course as the whole atmosphere of the School of Art and Design is so relaxed and you really do feel part of a community. The photography facilities and staff are amazing, and because the course is so open, you are free to develop your practice in any way you want."